The time is the1870s, and the place is the expensive resort town of Vevey, Switzerland, a town which fills up with Americans every June. Here we meet a young American named Frederick Winterbourne, who has come from Geneva to visit his aunt. 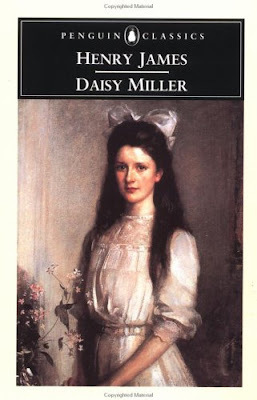 Winterbourne meets a fascinating young American named Annie "Daisy" Miller. Daisy is travelling with her mother and her obnoxious nine-year-old brother, Randolph. The father is a wealthy businessman in Schenectady, New York, who has sent his family overseas to get some culture. Daisy is strikingly beautiful and charmingly naive, and captivates Winterbourne immediately. But Daisy doesn't seem to understand that her flirtatious American ways are out of place in Europe: she does things like asking Winterbourne to take her rowing on the lake at eleven o'clock at night -- something no proper European girl would ever do. Daisy's attitude came as quite a shock to the Europeans she visited, as the cultures were very different. It was interesting to see how misunderstood she was and what people thought of her, when really she was not doing anything so out of the ordinary (in my opinion, anyway). This novella made me very thoughtful about how complex, yet how simple people are. Daisy was shallow and small-minded, yet always believed the best of other people; prattling and silly, outgoing and thoughtless. Everybody thought the worst of her, but she was really very pure of mind, mild and innocent. That may have been her only fault in the strict, rigid society of "worldy" American travelers in Europe. But really, I think she was just totally out of place; she didn't have the insight to adjust her behavior to other societies and manners, and was completely bewildered when polite society turned their backs on her when she thought they were friends. This made me think about how all the time we are told to "be ourselves, be unique", and to have that backfire on you is a very curious thing. People in society tend to reject someone who is not within what they have established as the norm. In the face of another culture that clashes with our own, is it fair to restrain oneself from being their true person in order to avoid rejection? How much of ourselves do we really hold back, in order to gain approval from everybody? In a certain way, I saw Daisy as brave. She didn't hold back, she wasn't afraid - and even though she may not have been completely conscious of the entirety of her attitude and actions, she wasn't afraid to be herself, no matter what anyone thought.